^ （英文） MacLeod, N, Rawson, PF, Forey, PL, Banner, FT, Boudagher-Fadel, MK, Bown, PR, Burnett, JA, Chambers, P, Culver, S, Evans, SE, Jeffery, C, Kaminski, MA, Lord, AR, Milner, AC, Milner, AR, Morris, N, Owen, E, Rosen, BR, Smith, AB, Taylor, PD, Urquhart, E & Young, JR. The Cretaceous–Tertiary biotic transition. Journal of the Geological Society. 1997, 154 (2): 265–292. ^ （英文） 恐龍骨頭被當作醫藥使用. BBC News. 2007 [2007-07-06]. ^ （中文） 董枝明. Dinosaurian Faunas of China. 北京，海洋出版社. 1992. ISBN 978-3-540-52084-9. ^ （英文） Mayor, Adrienne. The First Fossil Hunters: Paleontology in Greek and Roman Times. Princeton: Princeton University Press. 2000. ISBN 0-691-05863-6. ^ Sarjeant, William A.S. The earliert discoveries. (编) Farlow, James O.; and Brett-Surman, Michael K. (eds.). The Complete Dinosaur. Bloomington: Indiana University Press. 1997: 3–11. ISBN 0-253-33349-0. ^ （英文）Buckland, W. (1824). "Notice on the Megalosaurus or great Fossil Lizard of Stonesfield." Transactions of the Geological Society of London, series 2, vol. 1: 390–396. ^ （英文）Lhuyd, E. (1699). Lithophylacii Britannici Ichnographia, sive lapidium aliorumque fossilium Britannicorum singulari figura insignium. Gleditsch and Weidmann:London. ^ （英文）Gunther, R.T. (1945). Early Science in Oxford: Life and Letters of Edward Lhuyd, volume 14. Author:Oxford. ^ （英文）Delair, J.B., and Sarjeant, W.A.S. (2002). 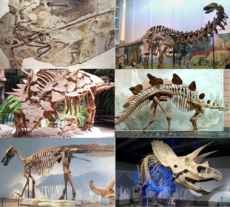 The earliest discoveries of dinosaurs: the records re-examined. Proceedings of the Geologists' Association 113:185-197. ^ （英文） Mantell, Gideon A. Notice on the Iguanodon, a newly discovered fossil reptile, from the sandstone of Tilgate forest, in Sussex.. Philosophical Transactions of the Royal Society. 1825, 115: 179–186 [2007-02-21]. doi:10.1098/rstl.1825.0010. ^ （英文） Sues, Hans-Dieter. European Dinosaur Hunters. (编) James Orville Farlow and M. K. Brett-Surman (eds.). The Complete Dinosaur. Bloomington: Indiana University Press. 1997: 14. ISBN 0-253-33349-0. 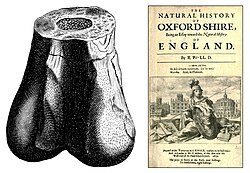 ^ （英文） Holmes T. Fossil Feud: The Bone Wars of Cope and Marsh, Pioneers in Dinosaur Science. Silver Burdett Press. 1996. ISBN 978-0382391477. ^ （法文） Yans J, Dejax J, Pons D, Dupuis C & Taquet P. Implications paléontologiques et géodynamiques de la datation palynologique des sédiments à faciès wealdien de Bernissart (bassin de Mons, Belgique). Comptes Rendus Palevol. 2005, 4 (1-2): 135–150. doi:10.1016/j.crpv.2004.12.003. ^ Michard, Jean-Guy. 第二章：尋找名分. 《恐龍：失去的侏羅紀王國》. 發現之旅. 20. 萬美君/譯 2002年2月5日初版六刷. 臺北: 時報文化. 1995年3月10日: 第39–40頁. ISBN 978-957-13-1582-9 （中文（台灣）‎）. ^ （英文） 搏鬥中的恐龍. American Museum of Natural History. [2007-12-05]. （原始内容存档于2012-01-18）. ^ （英文） Carpenter, K. Evidence of predatory behavior by theropod dinosaurs.. Gaia. 1998, 15: 135–144 [2007-12-05]. （原始内容存档于2007-11-17）. ^ 杨孝文. 美国发现保存完好恐龙木乃伊. 新浪科技. 2007-12-04 [2018-03-04]. ^ 科普小组. 恐龙科考. 吉林电子出版社. 2006. ISBN 9787900444066. ^ （英文） Carpenter, Kenneth. Biggest of the big: a critical re-evaluation of the mega-sauropod Amphicoelias fragillimus. (编) Foster, John R.; and Lucas, Spencer G. (eds.). Paleontology and Geology of the Upper Jurassic Morrison Formation. New Mexico Museum of Natural History and Science Bulletin 36. Albuquerque: New Mexico Museum of Natural History and Science. 2006: 131–138. ^ Colbert, E.H. (1968). Men and Dinosaurs: The Search in Field and Laboratory. E. P. Dutton & Company:New York, vii + 283 p. ISBN 978-0-14-021288-4.